Already as a boy, Engebret Hougen was widely known to have a good memory. 15 years of age, he was sent to sent off to meet Peter Christen Asbjørnsen, Norwegian writer and collector of folklore, who after one of his many travels sat despondent over the poor gain of source material. For two days straight, the boy told countless stories to the exhilarated traveller, of which many were included in his collections of folktales, which he published in cooperation with Jørgen Moe. 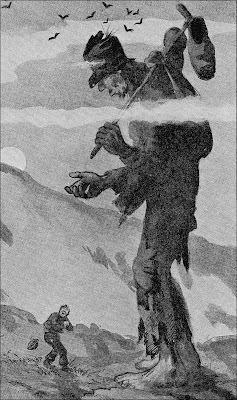 Engebret was the one who told Asbjørnsen the stories about Per Gynt, an infamous hunter from the valley of Gudbrandsdalen. One of them, depicting a meeting between Per and the ”bøygd” (Eng. 'bend', 'twist' or 'curve'), a giant, slimy serpent which stands as a hindrance to travellers, was published by Asbjørnsen, under the title “A reindeerhunt in Rondane”. This publication in turn inspired Norwegian author Henrik Ibsen to write his famed five-act play Peer Gynt, first published in 1867. Another tale in Engebrets’ repertoire was a peculiar tale by the name of ”Little Frick and the Fiddle”. In 1866 it was presented between two covers for the very first time. There are many variants of this tale, and its substance can also be identified throughtout Europe. In this version, Little Frick in sum emerge as a quite easygoing character, bearing much resemblance to the likes of the Ashlad and little Nisse, the boy who was never afraid. Being kindhearted, he gives away all of his hard earned money to a strange beggar, whom in fact proves to be a wizzard. As a token of gratitude, the boy is granted three magical wishes. In turn, these wishes make way for a turn of events that Little Frick could never have imagined in his wildest dreams. Once upon a time there was a farmer who had a single son, and this boy was so frail and in such poor health that he could not bear to go to work in the fields. He was called Frick, and as he was a tiny fellow, they called him Little Frick. Nonetheless, at home food was scarce, so one day his father went to the village to get the boy a job. But nobody wanted to hire his son, until he came to the sheriff; he could take him, for he had recently got rid of his errand-boy, and there was no one who wanted to work for him for it was rumored that he was a cheapskate. Well, that’s better than nothing, the farmer thought, at least he would get some food, for the sheriff would provide him with room and board; there was no mention of neither payment or clothes. When the boy had been there for three years, and wanted to leave, the sheriff gave him the full pay at once. He had earned one shilling a year; nothing more nothing less, said the sheriff; and so he got three shillings in total.Three shillings was certainly a lot of money for Little Frick, for he had never owned that much before. Nevertheless, he asked if he was not to be given some more? ”You have gotten more than you bargained for,” said the sheriff. "Shall I not have any clothes then?" said Little Frick. "What I had when I came here I've worn to pieces, and I've got nothing left," for now he was so tattered that there was only rags left on him. "You've got what we agreed on and three shilling thrown in for good measure, I'll will not hear another word from you," said the sheriff. But before he left, the boy had permission to go to the kitchen and fetch some food for his knapsack. And finally, Little Frick was off, on his way to town to buy some new clothes. He was both merry and happy, for he had never seen a shilling before, and frequently he grasped them just to make sure that all three were there.When he was far on his way, he entered a narrow valley surrounded by high mountains on all sides. He wondered what might be on the other side of these mountains, and how he could come across. But up he had to go, and up he went. But when he finally got to the top, there was nothing there but a great plain overgrown with moss. There he sat down to see one again if he had his shillings. Before he knew it, a beggar came along, and he was so tall and big that the boy began to scream when he saw how big he was. ”Very well, then it’s yours,” said the boy. When he had walked for quite a bit, Little Frick got tired and sat down to rest once more. When he looked up, there was another beggar, but he was even bigger and uglier than the last one, and when the boy saw just how grusome he was, he began to scream. ”Don’t be afraid, I won’t hurt you, I only ask for a shilling in the name of God,” said the beggar. Then he walked for quite a bit, until he once again got tired, he sat down to rest. Right away, another beggar came along; but this one was so big and ugly, that when the boy looked up, he looked right up to the sky. And once again, Little Frick began to scream. And so the beggar got the last shilling, there was nothing more to speak of; for each of them a shilling of their own, and he had nothing. ”Since you have such a good heart, that you have given away everything you own,” said the beggar, ”then I shall grant you one wish for each shilling”. It was the same beggar that had gotten all three; he had only transformed himself for each time, so that the boy would not recognize him. A fiddle like that he would recieve, but that was not much of a wish, in the beggars’ opinion; ”you should wish for something better for the other shillings”. That he should have, but that was not much of a wish, said the beggar; ” you should wish for something better for the last shilling”. ”That’s better,” said the beggar, and then he strode of, disappearing between the mountains. The boy lay down to sleep, and the next day he came down from the mountains, carrying with him his fiddle and his rifle. First he went to the shopkeeper and asked for clothes, and at one farm he asked for a horse, and at another he asked for a sledge, and somewhere he asked for a fur-coat, and not once did anyone turn him down, even the stingiest folk; for they all had to give him the first thing he asked for. Finally, he traveled through the village like a nobleman, with his horse and his sledge. When he had traveled for quite a while, he met the sheriff whom he had served. "Good day, master," said Little Frick, as he pulled up and greeted his old employer. "Good day," said the sheriff; "Have I been you master?" he asked.”Yes, don’t you remember, I served you for three years for three shillings,” said Little Frick. ”Oh, a little bit of this, a little bit of that,” said Frick. ”And now you’re such a merrymaker that you travel about with a fiddle as well?” asked the sheriff. Sure, why not said the sheriff, for he was willing to bet both his horse and his farm and a hundred bucks even, that this craziness could not be done. But just as the shot was fired, the magpie fell into a large thicket, and the sheriff strode off to fetch it. Right away, Little Frick started to play his fiddle, and made the sheriff dance so the thorns tore his clothes, and as he danced and cried and begged the boy to stop, he got so tattered that only rags were left on him. ”Look at you, now are as ragged as I was when I left after three years of serving you,” said the boy, ”So now I leave you left with what you got.” But, first, the sheriff had to pay him what he had wagered on. When the boy came to the town, he found a room at a tavern. There, he started to play his fiddle, and all that came had to dance, and the boy lived happily and carefree, for no one could deny him the first thing he asked for. But just as they were all in the midst of their fun, came the watchmen and dragged the boy off to the town-hall: for the sheriff had laid a charge against him, and said he had ambushed him and robbed him, and nearly taken his life. Now the boy was to be hanged, there was nothing more to speak of. But Little Firck knew what to do, for he still had his fiddle. And as he started to play, the watchmen danced until they layed flat on the ground, gasping for breath. Then they send soldiers and guards in their stead, yet it fared no better with them; when Little Frick played his fiddle, they simply had to dance, as long as he stroked its strings, but they were half dead long before he got tired. Finally, they sneaked up on him while he was sleeping at night, and when they got him, he was sentenced to hang at once. Immediately they left for the gallows. There was a great crowd of people who flocked together to see this wonder, and among them was the sheriff who was so happy to at last getting amends for his lost money, and finally see the boy hang with his own two eyes. Yet, Little Firck knew who to take his time; he was frail from the beginning, and made himself even weaker still. He also took his rifle and his fiddle, there was no use trying to take that away from him. And so, when he came to the gallows, and had to mount the steps, he halted on each step. At the top he sat down and asked if they could grant him one last wish: he wanted to play a song on his fiddle before they hung him. No, there was no denying the boy his request, for, you know, no one could refuse him what he asked for. But the sheriff begged, for the love of God, do not let him stroke a single string, for then they would all be over and done with. If the boy were to be allowed to play, then they at least had to tie himself to the birch over there, he pleaded. Little Frick did not hesitate, and started to play his fiddle, and everyone who was there had to dance, both those who were on two feet and on four, priest, and bailiff, and lawyer and sheriff alike, side by side, men, dogs and pigs. They danced and laughed and screeched all that they could muster; some danced until they fell unconscious, some even they danced until they lay for dead. 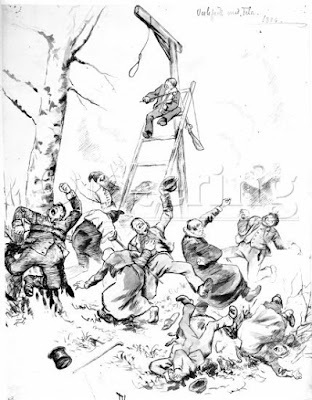 It went wrong with all of them together; but worst off was the sheriff, for there he was, tied to the birch, and he danced and scraped his back against the trunk. There was no one who ever thought of doing anything about Little Frick, and away he went with his rifle and his fiddle, and he lived merrily and happily all his days, because nobody could say no to the first thing he asked for. In 1952, the fairytale about Little Frick and his fiddle gained national stardom when being introduced as an animated short film directed by Norwegian director Ivo Caprino. This was the first showcase by Caprino which fetched its theme from Norwegian folktales – later on he were to do many more (among them being the Fox’s Widow). Something like that had never been done before him, but Caprino was not just another filmmaker; he was the great grandson of Norwegian painter Hans Gude, who assumed the responsibility for the first illustrated edition of Norwegian Folktales, published in 1879. Asbjørnsen also chose to dedicate the release to Gude. Film critic Arne Hestenes believed that Norway passed up on a great chance by not to sending the film to the Cannes Film Festival in May 1952. Later that year, it won the first prize at the Venice Children's Film Festival. Afterwords, Norwegian actor Arne Bang-Hansen wrote with a certain sarcasm: "The new artform had to go Italy to gain fame and fortune." And the film indeed caused quite a stir. When Swedish film legend Ingmar Bergman visited Caprinos film studio several years later, he specifically asked for about Little Frick and the Fiddle, for his private of collection of film!